Steven Wright is a famous Comedian from USA, he is 63 years old and still alive, born December 6, 1955. 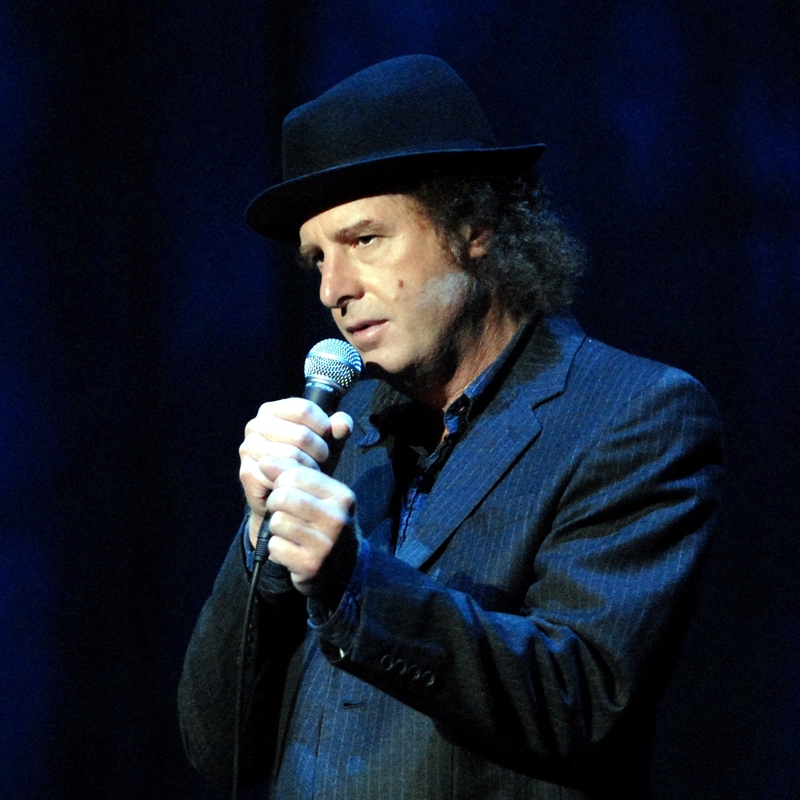 Steven Wright is an American actor, writer and stand-up comedian from Burlington, Massachusetts. He is known for its slow, dry and monotonous expression of ironic, witty and sometimes confusing jokes and one-liners. Wright in 1985 he brought a comedy album entitled "I Have a Pony". In 1992, Wright, a recurring role on the TV sitcom "Mad About You." He later won an Academy Award for his short film "The Appointments of Dennis Jennings." He also appears as the voice of radio DJ in the movie "Reservoir Dogs". He is born under the zodiac sagittarius, who is known for Philosophical, Motion, Experimentation, Optimism. Our collection contains 81 quotes who is written / told by Steven, under the main topics: Funny, Birthday, Car, Fitness, Funny. "I hooked up my accelerator pedal in my car to my brake lights. I hit the gas, people behind me stop, and I'm gone"
"I have the world's largest collection of seashells. I keep it on all the beaches of the world... perhaps you've seen it"
"I have an existential map. It has 'You are here' written all over it"
"I have an answering machine in my car. It says, I'm home now. But leave a message and I'll call when I'm out"
"I had to stop driving my car for a while... the tires got dizzy"
"I had some eyeglasses. I was walking down the street when suddenly the prescription ran out"
"I had a friend who was a clown. When he died, all his friends went to the funeral in one car"
"Everywhere is within walking distance if you have the time"
"Ever notice how irons have a setting for permanent press? I don't get it"
"Don't you hate when your hand falls asleep and you know it will be up all night"
"Do you think that when they asked George Washington for ID that he just whipped out a quarter?" "Curiosity killed the cat, but for a while I was a suspect"
"Babies don't need a vacation, but I still see them at the beach... it pisses me off! I'll go over to a little baby and say 'What are you doing here? You haven't worked a day in your life!'" "At one point he decided enough was enough"
"A lot of people are afraid of heights. Not me, I'm afraid of widths"
"When I was a little kid we had a sand box. It was a quicksand box. I was an only child... eventually"
"It doesn't make a difference what temperature a room is, it's always room temperature"
"I met this wonderful girl at Macy's. She was buying clothes and I was putting Slinkies on the escalator"
"I live on a one-way street that's also a dead end. I'm not sure how I got there"
"I replaced the headlights in my car with strobe lights, so it looks like I'm the only one moving"
"My friend has a baby. I'm recording all the noises he makes so later I can ask him what he meant"
"I went to a general store but they wouldn't let me buy anything specific"
"I saw a bank that said "24 Hour Banking," but I don't have that much time"
"I remember when the candle shop burned down. Everyone stood around singing 'Happy Birthday.'" "I play the harmonica. The only way I can play is if I get my car going really fast, and stick it out the window"
"When I was a kid, I went to the store and asked the guy, Do you have any toy train schedules?" "My theory of evolution is that Darwin was adopted"
"I went to a restaurant that serves "breakfast at any time". So I ordered French Toast during the Renaissance"
"I poured spot remover on my dog. Now he's gone"
"Last night I stayed up late playing poker with Tarot cards. I got a full house and four people died"
"My neighbor has a circular driveway... he can't get out"
"I went to the museum where they had all the heads and arms from the statues that are in all the other museums"
"I got this powdered water - now I don't know what to add"
"I got a chain letter by fax. It's very simple. You just fax a dollar bill to everybody on the list"
"I busted a mirror and got seven years bad luck, but my lawyer thinks he can get me five"
"I bought some instant water one time but I didn't know what to add to it"
"How young can you die of old age?" "Hermits have no peer pressure"
"George is a radio announcer, and when he walks under a bridge... you can't hear him talk"
"What a nice night for an evening"
"There's a fine line between fishing and just standing on the shore like an idiot"
"There was a power outage at a department store yesterday. Twenty people were trapped on the escalators"
"The other day I... uh, no, that wasn't me"
"The Bermuda Triangle got tired of warm weather. It moved to Alaska. Now Santa Claus is missing"
"Sponges grow in the ocean. That just kills me. I wonder how much deeper the ocean would be if that didn't happen"
"Right now I'm having amnesia and deja vu at the same time"
"On the other hand, you have different fingers"
"In Vegas, I got into a long argument with the man at the roulette wheel over what I considered to be an odd number"
"If you were going to shoot a mime, would you use a silencer?" "If you tell a joke in the forest, but nobody laughs, was it a joke?" "If you shoot at mimes, should you use a silencer?" "If you had a million Shakespeares, could they write like a monkey?" "If you can't hear me, it's because I'm in parentheses"
"If you are in a spaceship that is traveling at the speed of light, and you turn on the headlights, does anything happen?" "If it's a penny for your thoughts and you put in your two cents worth, then someone, somewhere is making a penny"
"I went down the street to the 24-hour grocery. When I got there, the guy was locking the front door. I said, 'Hey, the sign says you're open 24 hours.' He said, 'Yes, but not in a row.'" "I watched the Indy 500, and I was thinking that if they left earlier they wouldn't have to go so fast"
"I was walking down the street wearing glasses when the prescription ran out"
"I was trying to daydream, but my mind kept wandering"
"I was reading the dictionary. I thought it was a poem about everything"
"I was a peripheral visionary. I could see the future, but only way off to the side"
"I think God's going to come down and pull civilization over for speeding"
"I stayed in a really old hotel last night. They sent me a wake-up letter"
"I invented the cordless extension cord"